Single draw with sunshade by Wood of Liverpool. Main tube has green leather covering with a couple of bumps but otherwise in nice condition. The telescope is signed in script ‘Isaac Thos. Bartlett’ a storied sailing master on the East Coast working in the period 1840—1880. 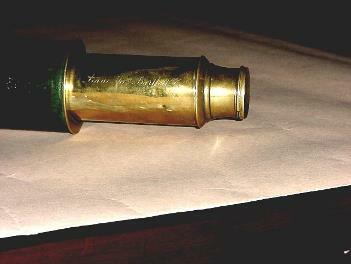 Lacks eyepiece slide cover. Good optics. A wonderful and rare piece of Canadian maritime history.